AFL Queensland and Associated Independent Schools (AIC) are proud to announce AFL has become an official AIC aggregate premiership competition. Dean Warren, AFL Queensland CEO, said he was delighted to partner with the largest boys school sports association in Queensland. 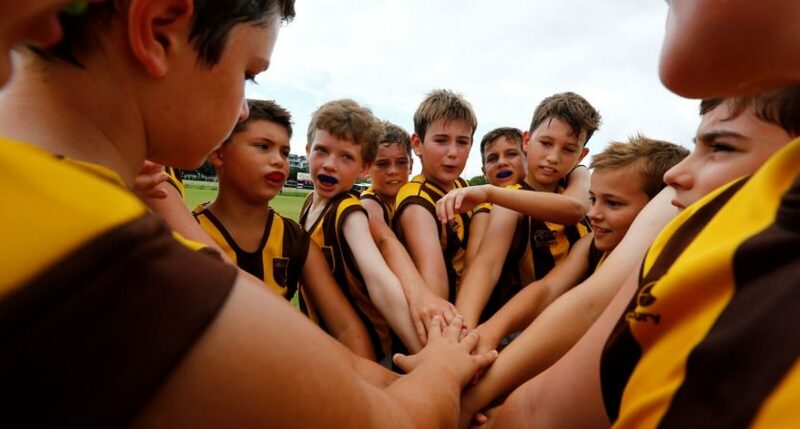 “AFL school competitions are critical to growing our player development and participation pathways, and are a key pillar as we aim to be the the most accessible team sport in Queensland,” Warren said. Across the seven colleges, 45 teams and close to 900 students will participate across Sandgate AFC, Yeronga AFC and St Laurence’s playing fields each weekend. Grade 8/9 and Open Divisions will meet for friday night footy matches, providing a wonderful opportunity to showcase talent and bring school communities together. As part of their commitment to growing the AIC competition, AFL Queensland have installed a full size oval within the grounds of Marist College Ashgrove for training and school programs. In addition a youth size oval has also been installed at St Laurence’s College Plating Ovals (Runcorn) which will host the Grade 7 Division each week. AIC schools have a history of producing notable AFL players. Among those include the following alumni that have gone on to pull on a Lions jumper; Padua College’s Jacob Allison and Harris Andrews, St Laurence’s Archie Smith and Marist College’s Charlie Cameron. The son of three time Hawthorn premiership captain and current Brisbane Lion, Luke Hodge, will represent St Laurence’s College in the AIC Grade 5A Division. Hodge sees the growth of AFL in AIC schools as a sign of the growing popularity of the game in Queensland. “When we first came up here we spoke to our eldest son (Cooper), who is mad about football, and told him that he might have to be flexible, he may have to play soccer which he has tried before and loved, or even try league or union,’’ he said. “He was open to that because he realised to make some good friends he might have to change codes at school but he could still play AFL on weekends. But we moved into Morningside which is AFL mad, and at his school he made three or four really good mates who loved AFL, which was a bit of a shock to us, but I think it shows that AFL is taking some major steps in Queensland. Round 1 of the inaugural AIC AFL competition commences this Friday 8 February when Villanova College meet Padua College in the Grade 8/9 Division to be played at Yeronga AFC.